Cleans tough denture stains, controls odor, and leaves dentures feeling clean all day. Drop one Polident Overnight tablet into a denture bath or glass containing enough warm water (not hot) to cover dentures. Allow dentures or removable bridge to soak in effervescing solution overnight. After soaking in solution overnight, rinse dentures with running water. For best results, brush dentures using the Polident Overnight solution and rinse again. 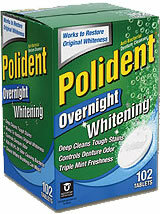 For clean, minty fresh dentures, use Polident Overnight every night.